Some "unfinished business" that's finally being handled. Back in 1964, Carroll Shelby had the idea for a big block Shelby Cobra Daytona Coupe. Along with swapping out the 289 V8 for a NASCAR inspired big block, Shelby asked fabricator John Ohlsen to lengthen the car’s chassis, using one of the six existing Daytona Coupes (CSX2286, specifically) as a test dummy of sorts. The result would have been Shelby’s “secret weapon” for the 1964 24 Hours of Le Mans. There were Ferraris to beat. Unfortunately, the car was damaged during its journey to France and it never raced. It was later converted back to its original 289 configuration. And that was that for the 427 big block Daytona Coupe. Until now, that is. Shelby American has announced that it will finish what Carroll Shelby began with a limited production series of big block Shelby Cobra Daytona Coupes. All six will be built to Shelby’s exact specifications. The first in the series, CSX2603, was on display last week at Pebble Beach. “We are taking care of some ‘unfinished business’ for Carroll Shelby,” stated Shelby American CEO Joe Conway. “It was sometimes called the ‘car that never was’ because a lone big block Daytona prototype was built but never raced. “We plan to complete this amazing program by offering six turn-key 427 powered Daytona Coupe racecars, which is the same number as the small block versions built in the 1960s.” The engine, paired to a four-speed manual, has 550-plus-hp and comes directly from Shelby Engine Company. The car’s total weight is 2,200 lbs. 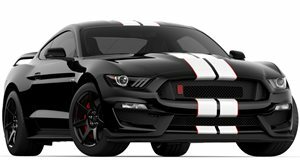 Each one will be assigned a Shelby CSX2000 series serial number for the official Shelby Registry. Legendary racing driver, Bob Bondurant, test drove the original prototype, stating that it “went like stink” and predicted it could top 200 mph, thanks to its big block power and brilliant aerodynamics. Pricing for the continuation cars hasn’t been announced, but you can be assured each of the six will be very expensive.